Hair Style Changer is a brand new app with tons of potential. It is a one of a kind app that allows its users to make an accurate decision when deciding to change their hair style. The app has tons of uses, particularly for saving you tons of money when letting new barbers experiment with your hair. 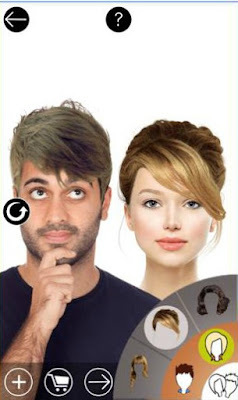 There are tons of options for both men and women, and sometimes things can get quite funny when you start using “unusual” hair styles on yourselves. The Hair Style Changer app comes with tons of hair style designs, both old ones and new. Women get packs like fringe, blond, bob, and mix packs, while men can choose from packs like savvy, mowie, worldcup, kooples and tons more. All you have to do is choose a picture that suits you well from your phone’s library, and place it in the app. After that, you can easily scale the size of the hair to make a better fitting hair style. There are also customizable options like changing your hair color. It is a great app for people that just don’t have any idea of what their next hair style looks like. No more endless search on Google, when you can just casually check out almost every other hairstyle there is directly on yourself. If you want to check out the app, you can find and download it from Google Play.